What’s The Deal With The Foam Head? Maybe you don’t think much about the foam head on a freshly poured glass of beer—but you probably should. Some people like a little more foam, while others prefer less or none. No matter how you feel about that top layer of foam, you should understand what it is and why getting it right is so important to really tasting a beer. Here’s what you need to know. The fermenting yeast in beer releases gas that creates carbonation when beer touches the air. This is why beer is fizzy if it is stored properly before it is served, and why beer is flat if it comes into contact with air before serving. The yeast and hops act together and create the carbon dioxide bubbles of the gas. This means that the fizz, or eventual foam head on a well-poured beer, will have a distinct smell and flavor. The foam head doesn’t only allow the carbonation to escape from the liquid. It also adds the aroma of the beer and the initial flavor to the first sip. We usually think of wine as the drink that you sniff before drinking, but not beer. Yet serious beer drinkers know to sniff the foam head to begin picking up the beer’s flavor notes and its distinct scent. Since aroma has a lot to do with how we perceive taste, that first sniff is important for making sure that you get the full range of flavor from the beer. And because the foam head has a flavor as well, you will want to make sure to sip at it slowly when you begin drinking. Different brews have thicker or thinner heads, depending on their yeasts and the ratios of ingredients used to brew them. The head on a hefeweizen will be legendarily creamy and full, whereas a stout’s head will be much thinner overall. In order to come away with the perfect pour–and the perfect head, it’s important to practice proper pouring technique. The angle of the glass is paramount to getting the head right. You should start by holding your glass at a 45-degree angle. Then pour the beer directly into the glass from above. You should be aiming the stream of liquid right at the middle point of the inside of the beer glass. 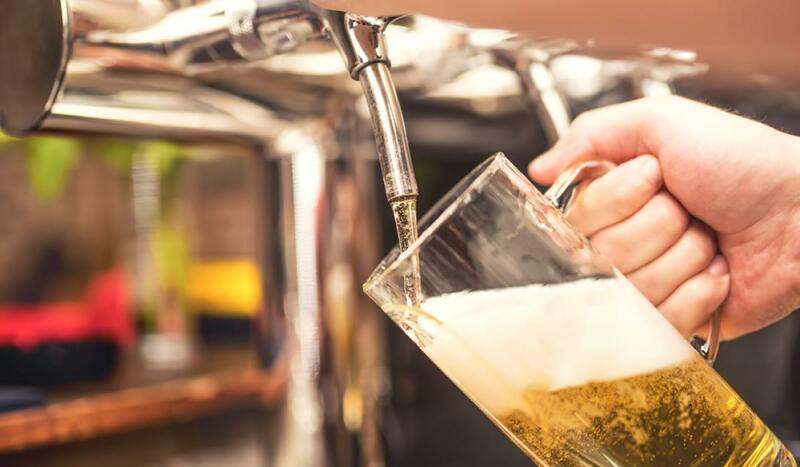 Once the beer is halfway full or a little more, tilt the beer back to a straight 90-degree angle and continue pouring the beer directly into the center of the glass–which is now a point on the glass’ bottom. There should have been no head while you were holding the glass at 45 degrees, but the head forms as soon as you pour into the glass at a right angle. The type of glass you use some bearing on the beer’s head, as well as its aroma and its flavor compared to other things you consume in the same sitting. Sometimes it takes practice get a perfect pour—but at least that practice is going to taste good!